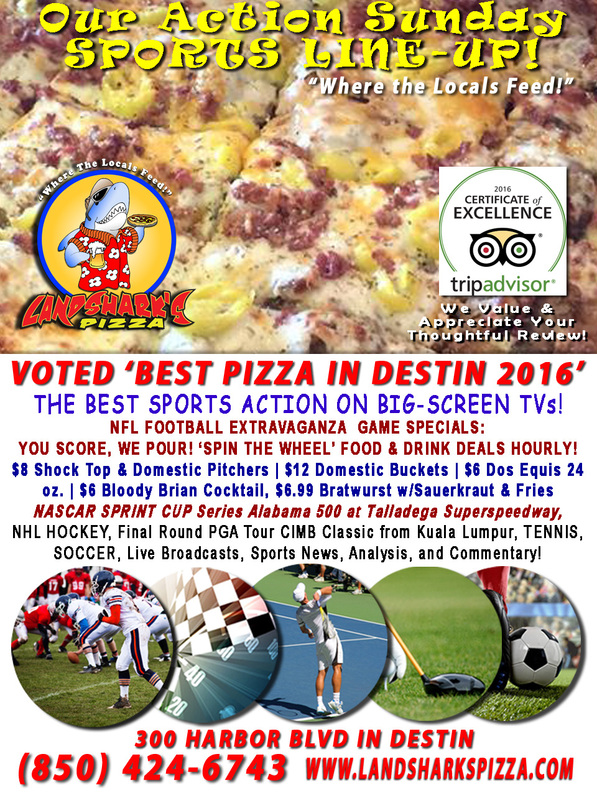 / Best Pizza In Destin Florida / DESTIN, FL NFL FOOTBALL SUNDAY Here at Landshark’s – YOU SCORE, WE POUR! $8 Pitchers|$12 Buckets, FOOD SPECIALS & More! DESTIN, FL NFL FOOTBALL SUNDAY Here at Landshark’s – YOU SCORE, WE POUR! $8 Pitchers|$12 Buckets, FOOD SPECIALS & More! WEAR YOUR FAVORITE NFL TEAM’S JERSEY AND GET A FREE BEER POUR WHEN THEY SCORE A TOUCHDOWN! 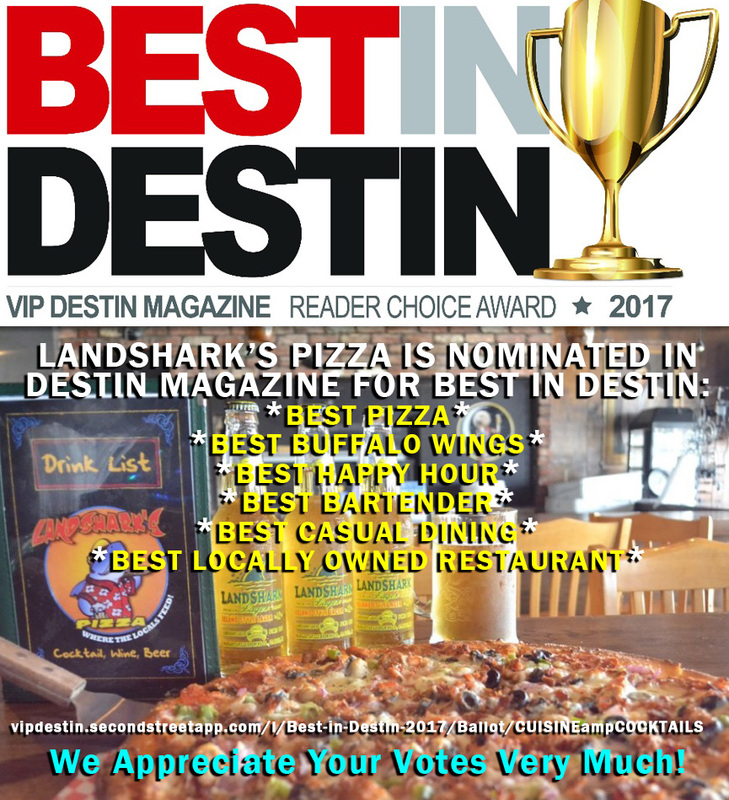 VOTED BEST PIZZA IN DESTIN 2016 IN DESTIN VIP MAGAZINE! GIVE US YOUR VOTE FOR 2017! Perfect day on the launch pad for NFL SUNDAY at Landshark’s Pizza in Destin, FL as we blast off game after game on an Army of Big Screens with CRAZY Food & Drink Specials Plus YOU SCORE WE POUR! ‘Spin the Wheel’ Deals on Food & Beverages every hour! We’re talkin’ SAINTS vs CHIEFS, PATRIOTS vs STEELERS, BUCS vs NINERS, VIKINGS vs EAGLES and LOTS MORE! $8 Domestic Pitchers | $8 Shock Top Pitchers| $12 Domestic Buckets | $6.99 Bratwurst & Sauerkraut & Succulent Seasoned Fries| $6 Bloody Brian Cocktail, AND MORE depending on how excited the owner gets! 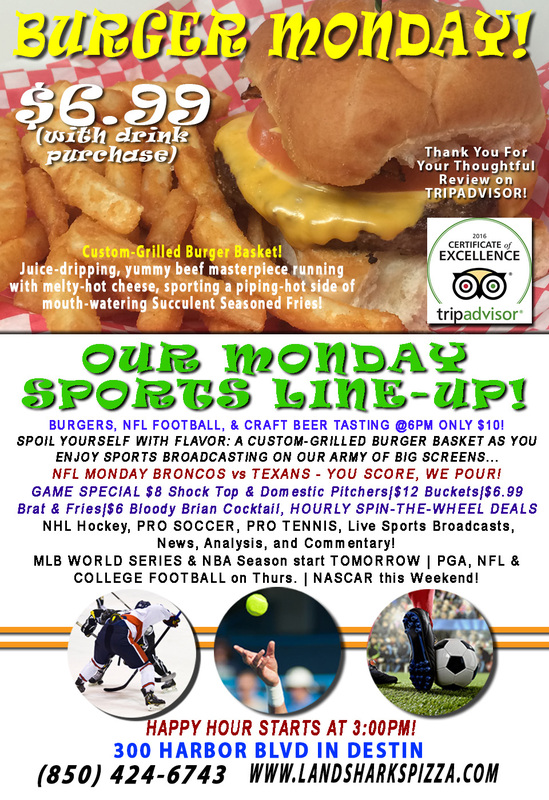 SPORTS ON OUR ARMY OF BIG SCREENS – We’ve also got NASCAR SPRINT CUP Series Alabama 500 at Talladega Superspeedway, Final Round PGA Tour CIMB Classic from Kuala Lumpur, NHL HOCKEY, PRO SOCCER, PRO TENNIS, plus plenty of other Sports Broadcasts, Sporting News, Analysis, and Commentary! MONDAY NIGHT NFL: BRONCOS vs TEXANS. Top that off with great food, fabulous drinks, a lot of fun, and a full day of competitive excitement. 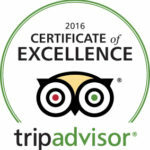 Award-Winning Pizza, Wings, & BBQ, plus a large selection of Appetizers, & Subs. 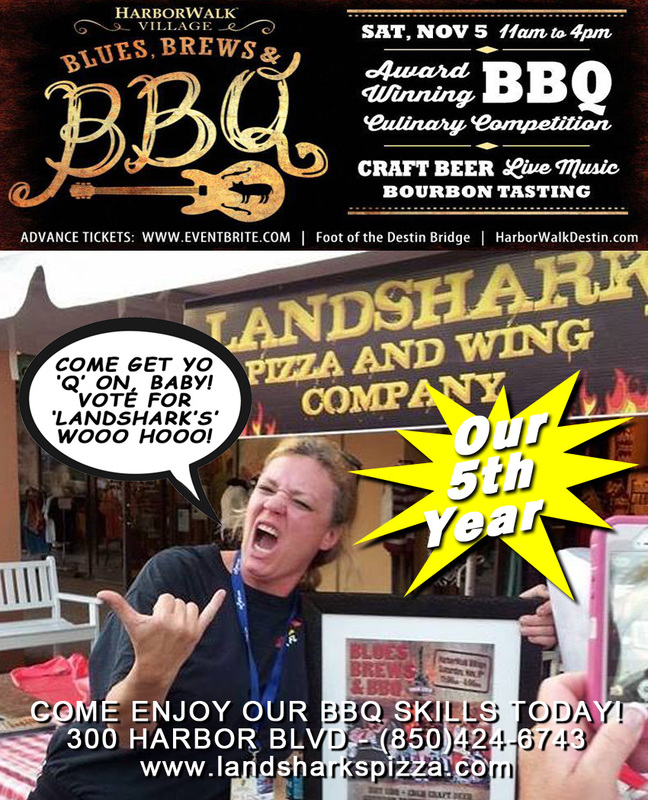 Previous Post: « Come See Landshark’s at 2016 DESTIN BLUES, BREWS, & BBQ HARBORWALK VILLAGE 2016!